As many of you already know, I have attempted this struggle before. However, I always give in and re-apply acrylics to my nails. I am self motivated to regrow my nail beautiful nails again. I have worn acrylic nails & gel nails off & on for well over a decade now. Yes, I know, I'm getting older everyday! Actually - *side note* in 1 month exactly today I will turn 32. Anyways, I felt like I was ready this time. I can remember years ago having long healthy strong nails. So I will blog my journey on getting those back. August 1st makes the start of this journey. 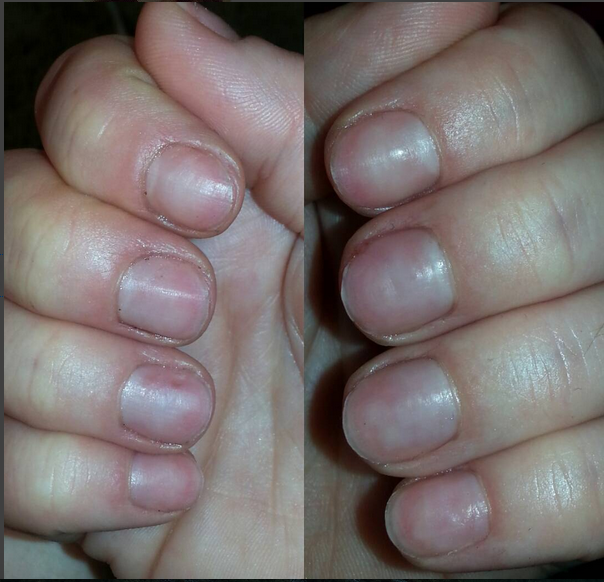 After I removed the acrylic off of my nails, I trimmed my weak, thin & brittle nails down. that I have abused and neglected. Currently right now I am using items I have around the house. One is a 2.5 fl oz scented (vanilla berry) cuticle oil that I purchased from nailliteinc.com. Next is a vitamin E oil that I purchased off of Ebay. I switch between the oils throughout the day to hydrate my nails & cuticles. After apply the oil I switch between 2 moisturizers. 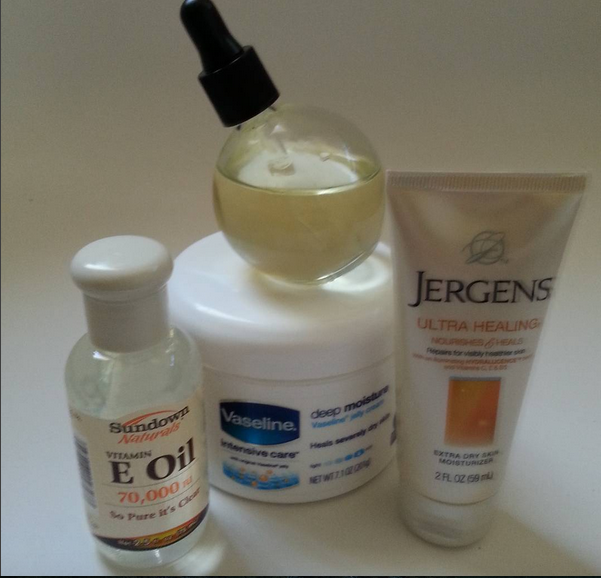 The first being Jergens ultra healing for extra dry skin lotion & the Vaseline deep moisture intensive care cream moisturizer. I didn't pick these 2 items out specifically for this nail growth journey. The jergens is a travel size lotion that I stock up on from time to time just so I have lotion in my car, in my house, at work, in every purse I own, etc. Its affordable, travel size and moisturizes enough to get the job down so my hands don't feel dry or cracked. And the vaseline cream was a beauty sample I received for free to test out. Its a little thick for my comfort to use on my hands during the day, but works great to apply to my hands & feet right after the shower or right before bed. Other than that, there isn't much more to say. I nails are extremely weak & thin. Day one 3-4 of them are already starting to get vertical splits in the nails down to the nail bed which is quite painful, but I am determined to succeed at the challenge. I keep a 220 grit nail file on me at all times to catch any rips, tears, cracks & splits in my nails immediately as they happen to prevent further breakage. I will continue to moisturize 3-5 times a day (if not more). Keep an eye out for my week 1 nail growth journey update!